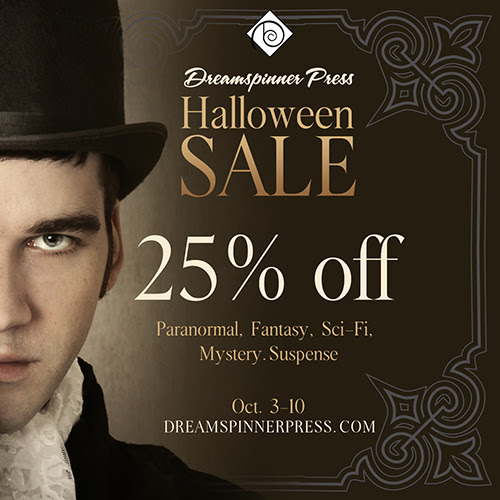 Today’s the last day to get Walk a Mile at 25% off during Dreamspinner’s Halloween Sale! I want to make sure everyone knows about Dreamspinners early Halloween sale! All paranormals, fantasies, sci-fi, mystery and suspense e-books are 25% off but the sale ends today! It won’t be your last chance to get Walk a Mile at a discount, however! I’m going to be taking over the Dreamspinner Facebook page from 2-4 pm EST Sunday, Oct12th and there will be a coupon code good for several days offered then. I do hope you’ll drop in for a chat and some giveaways! The Pride Promotions book tour for Walk a Mile is ongoing:today I’ll be at Romance the Night, Cate Ashwood, and also at Shae Conner’s too. Stop by, enter the Rafflecopter, and ask me some questions–I’d like to hear from you! This entry was posted in Uncategorized and tagged announcements, contests, discounts, Dreamspinner Press, interviews, promo, reviews, Sarah Madison, Unspeakable Words, Walk A Mile, writing by Sarah Madison. Bookmark the permalink.